We have just been seated on the motorized cart that takes handicapped passengers to the departure gates when the sirens go off. COLOR RED, COLOR RED. The airport’s public spaces empty. From the shatter-proof window of the safety niche the trail of the Iron Dome missile might be mistaken for an aircraft’s wake, did it not rise so steeply and from so low. A second trail. Moments later, two muffled explosions. Now the All Clear. We proceed to the gate for Tbilisi. We are reluctant to leave the country, but then, our sons all are beyond the age for combat service, our grandsons have not been called up, and we ourselves, well into our eighties ─ I walk with crutches, my wife, Judy, with a cane ─ can no longer be of use in a country at war. Reluctant. I cannot shake off the feeling of desertion, even though it’s a flight of barely two hours and we can be back within a day. For Judy, my wife, it’s the first trip to Georgia. For me, a return. Moscow seems deserted as our hosts from the Academy drive us from the airport to the hotel; it may be the late evening hour. I stand in line for food at one of the hotel’s top floors. The few items on display are purchased by weight. I buy two hundred grams of some salted fish, the only thing that I could square with the Jewish dietary laws. In the morning, the flight to Sukhumi, a town on the Black Sea in Georgia’s western region of Abkhazia. The conference ─ immunology, immunity, and cancer ─ takes place in the dacha that had been Lavrenti Beria’s, the chief of the secret police until he fell from grace and was put to death. It is the first conference in the post-Stalin USSR to which scientists from abroad have been invited, some twenty-five of us. A professor at the University of California, I had at first declined the Academy’s invitation, in protest against the reported antisemitism of the Soviet Union, and then decided to come and see for myself. Among the Soviet scientists, there are several with unmistakably Jewish names. There are also some who, in the course of a coffee break, hint at their years in the gulag. And there is a group of taciturn men in dark suits who encourage a steady social distance between their compatriots and the foreigners. Dinner the first evening. We are seated in small, mixed groups at round tables. Welcome. Toasts. Vodka, many glasses. A festive meal. I have my salted fish. To my right, an elderly Russian scientist, whose name I know from the literature. Across the table, the one Israeli participant; he is loud, cheerful, and tactless, dropping thoroughly uninformed comments on communism, the Soviet Union, and the situation of the Jews. The gentleman at my right pales. His napkin slides to the floor. As if groping to recover it, he brushes my knee. “For God’s sake, can you get him to stop,” he whispers. “He doesn’t know what he is doing.” One of the taciturn men retrieves the napkin from beneath my feet. Late next afternoon, I cut the sessions. A synagogue is located somewhere on the outskirts of the town; I had heard that from someone in Berkeley active in the movement for Soviet Jewry. The Academy and hotel personnel claim to know nothing of such a place; the authorities undoubtedly do know, and, in the shadowy, ambiguous world of Soviet policy, must somehow have tolerated its clandestine existence. I set out to find it. He stares at me, and lets me in. Someone reaches me a siddur ─ the prayer-book. The prayers are led by a younger man at an improvised pulpit facing a curtained chest; the service is read rapidly. Nobody speaks to me, only a furtive glance here and there. The men file out. “What time is shacharith” ─ the morning service ─ I ask the bearded man. I am there shortly after five in the morning. Another reader at the pulpit. He is into the first verses of praise, the pesuke de’zimrah. I take my tefillin from a pocket of my overcoat, place them on the bench to which I had been directed, and unwrap them. The tefillin are very small, a gift from my father when I enlisted in the U.S. Army in 1946; the straps that bind the encased parchment texts to arm and brow are folded to shape the wings of a bird. Kanfe Yonah, the wings of a dove. Elisha’s wings. More than two thousand years have passed since the day Elisha crossed the marketplace in a Judean town. A Roman squad accosted him. Open your hand, the quaestor ordered, drawing his sword ─ tefillin were forbidden under pain of death. It is the wings of a dove I purchased, Elisha said, spreading his fingers. And it was the wings of a dove the Roman saw in his palm. Elisha, baal knafaim, the Master of the Wings. The bearded man cries out, “He is one of us. He is one of us.” Agents of the secret police do not arrive on doves’ wings at the break of day. The reader halts. A great silence grips the room, as if of wonder suddenly descended. Then I am surrounded, held and hugged, and the bearded man is sobbing. They are Georgian Jews. They work in a kolkhoz, and twice daily they come together in this room, their place of worship and communality. The bearded man is their chacham, the rabbi; he had been to a yeshivah in Lithuania when he was young. I am with them most of the week. When I return to the dacha or to my hotel, the older men walk with me, and part at the entrance with a ringing Shalom. A defiance. I had known little about the Jews of Georgia. Now I learned. They are an ancient people. The Georgian chronicles have them arriving after the conquest of Jerusalem by Babylon in the sixth century BCE, and another wave during the persecutions under Vespasian in the first century CE. They have survived the endless tribal conflicts of the Caucasus, the depredations of Mongols, Turks, and Persians, Muslim fanaticism, the hostility of the Czars, Soviet repression, and they have yielded neither identity nor belief. Relations with Ashkenazi Jews have been reserved, the Georgian apprehensive of their religious nonchalance. Sukhumi was occasionally visited by Israelis from the embassy in Moscow. Israelis. Jews? Jews do not dine on ham and shrimp in the beach-front restaurants; Jews do not light cigarettes on shabbath. And now, here I am, with my tallith and tefilin and the tallith katan ─ the fringed garment ─ underneath my shirt, and I do not need a siddur, I know the services by heart, and though I have my meals in the dacha and the hotel, what I eat is permissible and can be made allowance for. They tell me that I am the first such Jew the community has encountered since shortly after the Communist revolution. And I learn that my life has made a turning point. Friday night. The room is packed. There are men I had not seen before, and women behind a screen of latticework. The alenu has been recited, the service concluded. One of the men, a doctor, invites me home for Kiddush. The chacham and others intervene. I make out words, pikuach nefesh ─ danger to life. To me, the chacham says, “You understand. We can’t!” There are tears in his eyes. No one leaves. I am taken by the hand to a courtyard and seated on a chair. It is cold and very dark. The darkness is uneven. Above, the uninterrupted darkness of a clouded, moonless night; forming around me a circle of a deeper, shifting darkness. The clouds part, and the circle is a ring of people. Many more than had been inside the room. One at a time, wordlessly, a man or woman steps from the ring and touches me. Touches my face, hands, chest. No word, only the touch. I am no longer David Weiss, a resident of California. I am David Reubeni. I am Eldad the Danite. I am come from the banks of the Sambation. Centuries ago. Yesterday. I carry news of the Lost Tribes. I am the link. I sit for hours in the dark. A week later, I am on a flight to Israel. My first. End of the journey. Nearly fifty years have passed. I sit at my desk in my home in Rehaviah, and write. The snow-capped peaks and alpine meadows of the Caucasus seem very far away from the sirens’ howling. In fact, the distance lies more in our minds than on the map; two hours separate the airports Tel Aviv ─ Tbilisi, and we can be home within one afternoon or evening. Twice daily our cell phone rings with news from our sons, and for the next few hours we can make believe we are on holiday. The Georgians make it easier. A kind of admiration, a respect, is extended to the Israeli, Hebrew, Jew ─ the distinctions generally neither understood nor recognized. The empathy has its roots in the long, scarred history of shared endurance, and in the enemy’s common face. The autocracy of the Czars. The lists of fallen on the front against the Germans in the Second World War run endlessly on the memorials in Georgian towns; here, the Holocaust is not a far-off fevered nightmare. Nor are flight and expulsion from places suddenly turned hostile ─ Abkhazia is a very recent memory. So is Soviet dictatorship. And Israel stood with Georgia in its war with Russia in 2008; that is very much alive in the street. The Georgians need not understand the peculiarities of Jewishness to sense an affinity with the Jews. In the courtesy we encounter when we announce we are from Israel there is no echo, as so frequently there is in other countries, of a strained reserve; I do not have to justify, explain, defend. Sukhumi is out of reach; relations between Abkhazia and Georgia have become belligerent, and the border is closed. Turning points, perhaps, cannot be repeated. Only recalled. The old Jewish quarter of Kutaisi, the second largest city, skirts the market. Pacing the web of cobbled alleys, streets, and courtyards, I find nothing of a Jewish presence, not even the indentation in a doorpost that might have held a mezuzah. Our driver questions a storekeeper. Yes, there had been Hebrews living here ─ he points to an apartment and a shop ─ they are gone, to Israel, sometimes they come back. 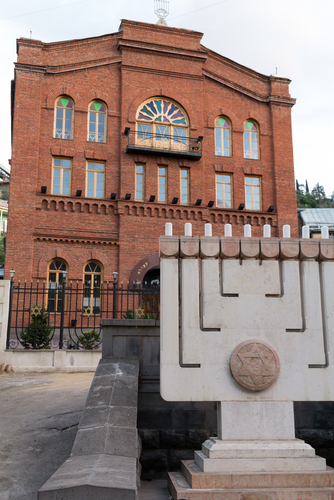 The Great synagogue of Tbilisi. Erected a hundred years ago, the three storeys of red brick still dominate the quarter. A flight of steps leads to the grounds; the gateway, made of black metal panels, represents the Tablets of the Law, Hebrew letters in gold proclaiming the Commandments. Portraits of venerable chachamim are framed in rows on a memorial of Jerusalem stone to the side of the main building. The sanctuary is poorly lit. I make out a figure at a desk near the ark. I introduce myself. He is the shamash, the custodian; he has no spoken Hebrew, only tourist English. The Georgian community has dwindled to a few thousand, he tells me, most of them in this city. After some minutes, he turns on the lights. The sanctuary is splendid ─ the pews a polished timber, marble columns, a filigreed transom, crystal chandeliers and gilded candelabras, Torah scrolls elaborate in sheaths of gold, brocade and silver. Outside, a wizened woman resting on a bench against the wall addresses me in Yiddish. She has somehow drifted here from the Ukraine. I give her whatever Georgian money I have left. A man occupying the far side of the bench moves closer; he is a Georgian Jew, somewhat younger than I. No, he doesn’t seek alms, he wants to chat; the tour groups always rush in and out. How long have we been in Georgia? What do we think of the country? At home, do I pray with a minyan? “Ah, yes, those . . .” He points to my crutches. “Yes, Elisha, that’s right,” I say. David W. Weiss is an author and professor emeritus at the Hebrew University–Hadassah Medical School in Jerusalem.